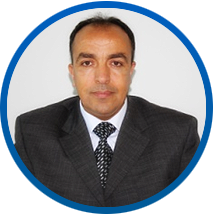 Manager of the Moroccan Tunisian project CODEMA (Design and development of bilingual educational tool for mathematics assistance). Partner: National Engineering School of Sfax (Tunisia). 2011-2013. Member f the ADO project (Implementation of automatic systems to process the non diacritic Arabic texts). Partner: Development Agency of the East of Morocco. 2007-2010. Member of the PROTARSIII, D11/18 project (Spline Functions and Wavelets, Application to Earth Sciences). Partner: Ministry of higher education in Morocco. 2005-2009. Member of the CNR-CNRST project (Ref: SPM01/02) (Approximation of d dimension data (d=1, 2, 3) by polynomials, splines or subdivision methods). Partner: National Institute of Applied Sciences of Rennes (France). 2002.